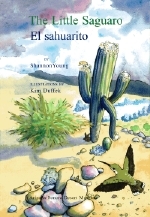 The Little Saguaro/El sahuarito is a heartfelt story about life's joys and challenges, as revealed in a conversation between a mother saguaro and her daughter. As this intimate story unfolds, the exuberant life of the Sonoran Desert literally swirls around the giant cacti. Readers learn about "human" struggles and emotions, while at the same time being charmed by the variety of fascinating desert plants and animals captured in exquisite watercolor art. Engaging information about desert ecosystems included at the back of the book will be useful for teachers, parents, and curriculum specialists. Shannon Young is a member of the Society of Children?s Book Writers and Illustrators in Oregon, where she lives. One of her goals is to write books that help young readers understand and value the environment, while also offering compelling life stories. Kim Duffek works in the Botany Department at the Arizona-Sonora Desert Museum while she pursues a second career as a wildlife artist. She is passionate about nature and art.